NATvision is a complete environment for the development and deployment of sophisticated image and high performance video processing applications, provided by N.A.T. It maps up from a broad range of hardware products combined with selected software technologies and engineering support. NATvision technology is utilizing today’s state of the art field programmable hardware acceleration (FPGA) resource boards which combine the performance and real-time advantages of FPGA based algorithms with software based image processing. Deployed as a complete system solution, NATvision provides all its advantages e.g. processing and data transfer performance and a nearly unlimited number of cameras. 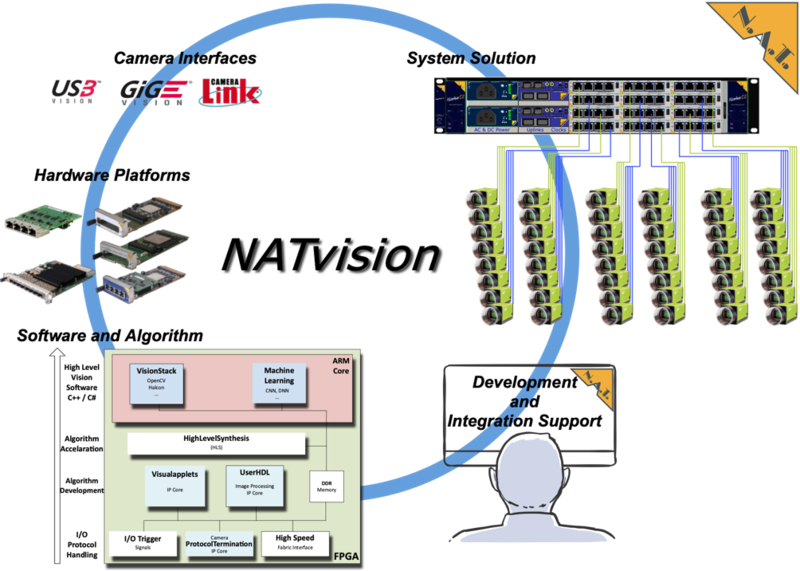 NATvisionsystem solutions are typically based on MicroTCA (aka MTCA), an open system standard for embedded applications combining flexibility and scalability with high speed data rate capabilities. However, NATvision components can of course be used standalone or be integrated into any other custom hardware. For example, in a small 2U, 19inch system footprint, up to 48 GigE-Vision cameras can be terminated and synchronised, the image data pre-processed and then distributed flexibly. Compared to existing solutions, NATvision reduces the number of cables, offers higher speed interconnects, timing and trigger signals, and reduces the development costs of FPGA/ARM based programming. Up to 64Gbps PCIexpress infrastructure with 128Gbps uplink. 40Gbps Ethernet infrastructure with 100Gbps uplink. Come and join N.A.T. at booth 3A/528 in hall 3A presenting these unique solutions. Please schedule your communication slot in Nuremberg with Vollrath Dirksen (Strategic Business Development Manager) by e-mail to Mrs. Bettina Bilogan (bettina.bilogan(at)nateurope.com). In case you are not able to join us in Nuremberg here is a short cut to the NATvision white paper, describing the NATvision solutions in great detail.